Mistra EviEM | SR1 How is mountain vegetation affected by reindeer grazing? SR1 How is mountain vegetation affected by reindeer grazing? Reindeer in Sarek. Photo: Oskar Karlin. 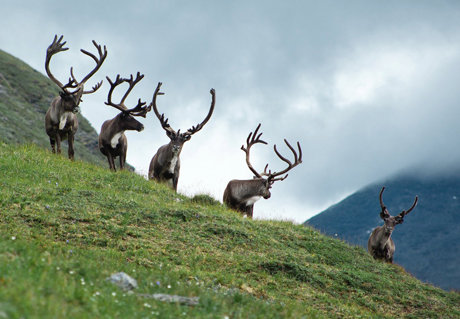 Are reindeer harming the mountain vegetation of Northern Scandinavia? Or is their grazing, on the contrary, essential for maintaining the diversity of the montane flora? Opinions on this issue have been divided over the years, but Mistra EviEM conducted a systematic review that attempted to achieve unequivocal answers. Some 20 years ago, severe overgrazing by reindeer became evident in parts of Northern Scandinavia. Among scientists and environmental conservationists alike, there was an increasingly widespread view that the reindeer were now ‘too many’ and that overgrazing was a problem throughout the reindeer-herding region, including its Swedish part. The prevailing opinion among present-day environmental managers is, rather, that the overgrazing of the past was temporary and local; that it seldom wrought lasting damage; and that, on the whole, reindeer grazing benefits the montane vegetation and enhances its species richness. Today, instead, fears are expressed that parts of the mountain region are becoming overgrown because of inadequate grazing pressure, although the number of reindeer is not much smaller than around 1990. In response to the Swedish Environmental Protection Agency’s recommendation, Mistra EviEM conducted a systematic review of what science has to say about the impact of reindeer grazing on mountain vegetation. No unequivocal picture of the situation has emerged, however. 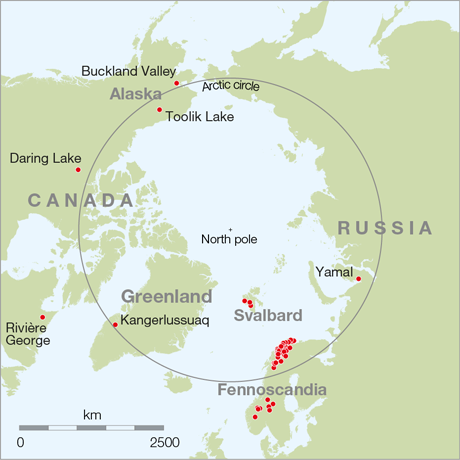 Research in this area has been conducted mainly in the Nordic countries and North America. Some researchers have compared the vegetation in regions that have long been subject to different grazing pressures. Others have fenced in small areas and studied how the vegetation inside the fences is affected by the reindeer no longer having access to it. 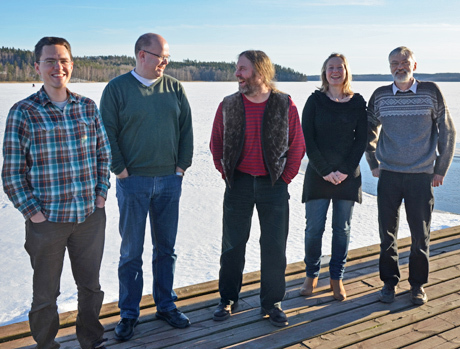 The review project started in October 2012 and was led by Jon Moen, professor of ecology at Umeå University. After an extensive literature search, the review team embarked on quality appraisal of about a hundred scientific studies found to be relevant to the subject of this project. Data from 41 studies found to have high enough quality were then analysed and summarised. A final report on the review was published on 23 February 2o15. Results have also been published in a popular summary and a fact sheet (see links at right). The red dots show where studies summarised in the review were conducted. We could confirm the generally held view that lichens are vulnerable to grazing and trampling by reindeer. Mosses did not seem to be sensitive to such exposure. We saw no significant overall effect of reindeer on grasses and similar plants, indicating that these supposedly grazing-tolerant species are not always promoted by reindeer grazing. Herbs (forbs) are reduced by exposure to reindeer, although they usually do not occur very frequently in arctic and alpine areas. This indicates that herbs are highly selected by reindeer and also vulnerable to grazing. We did not find strong evidence that shrubs generally are reduced by reindeer. The species richness of vascular plants was found to decrease with increasing grazing pressure. This was particularly evident in cold climates, where the productivity of vegetation tends to be low. Many individual studies reported effects that were significantly more positive or negative than the overall average. There is not sufficient information to explain this variation, but there may be many reasons for it. The global distribution of reindeer covers large environmental gradients, ranging from low-productivity to high-productivity sites, from dry to wet soils, and from forests to high alpine tundra. All vegetation types cannot be expected to respond in the same way to grazing and trampling. Our review has gathered a large body of data on vegetation responses to reindeer grazing, but we still have to conclude that the evidence base is too weak and scattered to inform environmental policy or reindeer management in a detailed way. It is unlikely that further studies can improve the evidence base much, unless they adopt standardised ways of quantifying reindeer impacts. However, an important point that we can make is that vegetation responses to reindeer grazing are context-dependent – they do not only depend on grazing itself but also on many other factors. This suggests that no single conclusion or recommendation on reindeer and their impact on vegetation can be universally applicable. The review team at a meeting in March 2013. From left to right: James Speed, Jon Moen, Bruce Forbes, Kari Anne Bråthen and Claes Bernes. Photo: Bo Söderström. Erfarenheter från renbetesprojektet. Intervju med Jon Moen.